PennsylvAsia: Upwardly Mobile Women in Urban China, March 29 at Pitt. 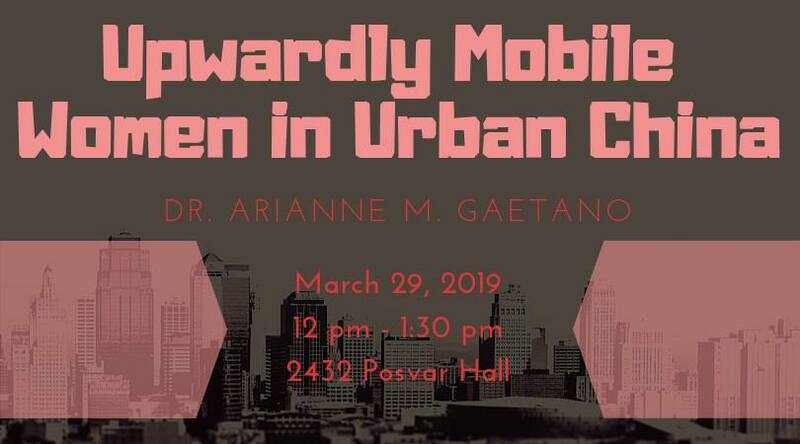 Upwardly Mobile Women in Urban China, March 29 at Pitt. The University of Pittsburgh's Asian Studies Center will present Dr. Arienne Gaetano and her talk "Upwardly Mobile Women in Urban China" on March 29. China's economic growth and urbanization have created new opportunities and roles for women, such as through education, migration, and employment. But with these changes, new challenges arise, especially as these impact on gender norms and relations. In this lecture, Dr. Arianne M. Gaetano, Associate Professor of Anthropology and Director of the Women's Studies Program at Auburn University, Auburn, Alabama will consider women of different socioeconomic status in the metropolises of Beijing and Shanghai, particularly unmarried and newly married rural migrant workers and educated urban professionals in their 20s and 30s. Dr. Arianne M. Gaetano is a cultural anthropologist, her research focuses on contemporary Chinese society. It runs from 12:00 to 1:30 pm in 2432 Posvar Hall (map) and is free and open to the public.